Below are links to some external websites which will provide you with some good background reading to help you with your new marketing project or website. Click on the social media logos below for helpful hints and tips on how to make the most of marketing your business. There are countless different companies offering web hosting and domain names, all at widely different prices. There are doubtless pros and cons of using any of them, however, I personally tend to use UK2 as they are competitively priced, have very few technical problems, and have excellent tech support when needed. However, I am also more than happy to use whichever company you want to go with! Another useful site which can give you a lot of information about an exisitng domain name is Who-Is. When presented with a page of text and images, our eyes are naturally drawn to the images. Social media posts and blogs with images are statistically far more likely to get more likes, retweets, and shares than those without. However, when sourcing images, it is VERY important to make sure you are allowed to use the image, do not simply assume that because it is on Google Images, it is free to use! 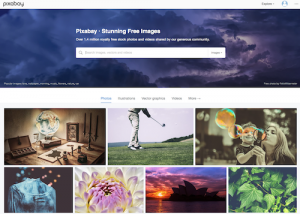 A good source of free images is available from Pixabay. The majority of images used on this site were sourced there and they were all free! Another option for free photography and images is a relatively new image bank called Pikwizard.com.